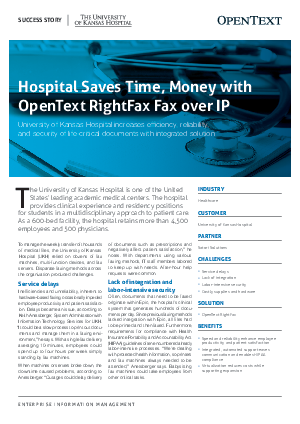 Read how the University of Kansas Hospital increased efficiency, reliability, and security of life-critical documents by implementing an integrated Fax over IP Solution. Learn how replacing costly, inefficient manual faxing, and eliminating the need to print on outdated hardware saved both time and money. Efficient document delivery returns a variety of benefits, but most importantly improves and enhances patient care.